Summer is a great time to let your dogs out so they can enjoy what nature has to offer. 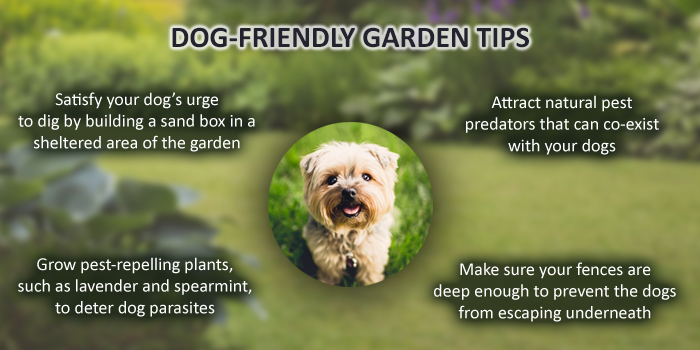 What better and more secure place than to have the dogs roam around your garden? It doesn't matter what breed of dog you have. 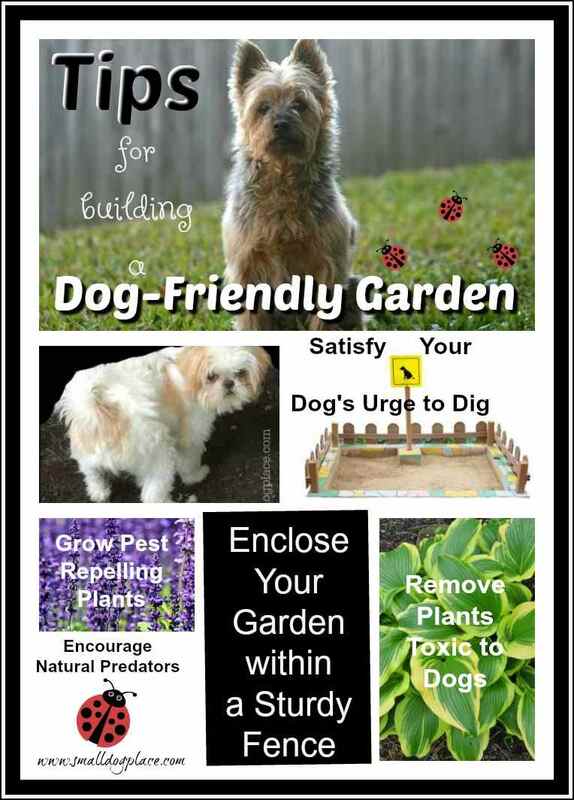 Here are three applicable tips to make your garden as dog-friendly as possible. 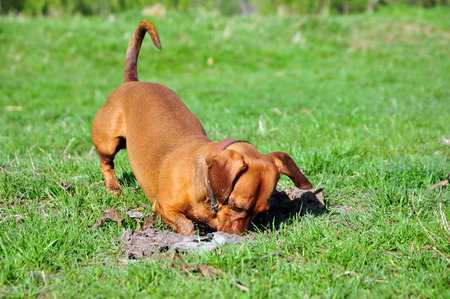 It doesn't matter if they are big or small, dogs of all breeds like to dig to some capacity. Dogs may dig for some reasons. First, they might dig to create a cooler resting spot. Second, they may do it as a form of entertainment or as a form of stress relief. Last but not least, some dogs may also dig to bury items they value such as bones and toys. While it is considered a natural behavior, digging is something you probably wouldn't want your dog to engage in too often. This is because digging may kill the garden plants and disrupt the stability of the flower bed. Digging may also destabilize the fence. Fortunately, there are certain steps you could take to keep such areas off limit. One method is to build a sandbox for your dog. Place the sandbox away from the garden crops and make sure the box is situated on top of the firm ground. Locate the sandbox in a sheltered area of the backyard. Fill the box with sand (try and keep the sand damp) then let the dogs do their thing. If all goes to plan, then the dogs will fall in love with the sandbox at first sight and not dig elsewhere. If that doesn't happen, then you'll need to spend some time training the dogs. One simple training method is to bury some of your dog's favorite treats or toys into the sand. When your dog digs up the treat, praise him and repeat a simple command like "dig in a box." Repeat this action multiple times, and your dog should eventually learn what to do with the sandbox. If your dog remains stubborn and continues to dig around the garden bed, then you may need to set up a short fence or place a layer of pebbles around the perimeter of the garden bed. 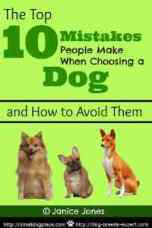 Recommended: My Dog Digging Holes in the Yard Has Me Irritated! Going outdoors puts your dogs at risk of getting affected by pests like ticks and mites, especially during the warm summer months. One way of deterring these pests from entering your garden is by growing pest-repelling plants. 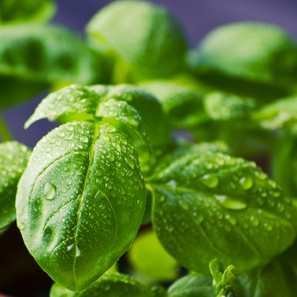 Examples of pest-repelling plants include basil, lavender, spearmint, and coriander. Growing these plants won't necessarily turn your garden into a pest-free zone, but they could act as a formidable barrier. As you'll eventually find out, there are many different types of pest-repelling plants. Before you consider growing them, be sure that they do not contain any compounds or chemicals that may be toxic to your dogs. For example, the beautiful chrysanthemum flower produces pyrethrins, a chemical which can act as a natural insecticide. 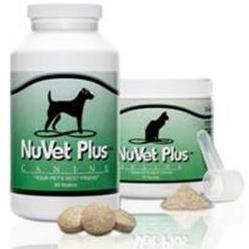 While this chemical may be natural, a large concentration of it may be toxic to the dogs. 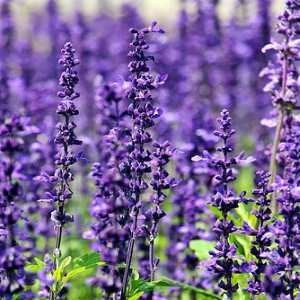 If mosquitoes are a problem in your area, you may want to consider adding some Mosquito Repellent Plants. 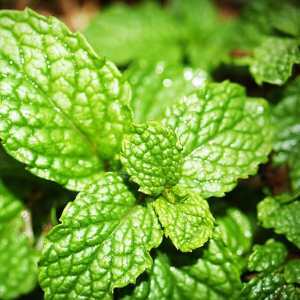 Lemon balm, lavender, citronella and catnip are good examples of plants that will help protect you and your dog from mosquitoes. Remember, mosquitoes spread West Nile and Zika to people but are also the cause of Heartworm disease in dogs. In addition to pest-repelling plants, you may also want to consider attracting natural predators of the pest. For example, natural predators of fleas include spiders, beneficial nematodes, and ladybugs. Insects and other natural predators will effectively eat those harmful pests without the need of any pesticide. Since commercial pesticides can be dangerous to dogs, it makes sense to attract insects such as lady bugs and praying mantises that will do the job for you. These insects like culinary herbs such as dill, caraway and fennel and could co-exist with your dogs and for the most part, will leave your garden plants alone. 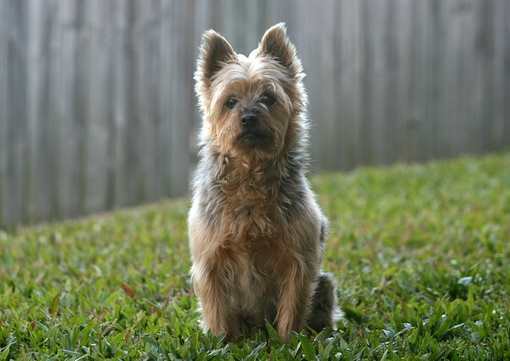 Here is an Australian Silky Terrier confined inside a sturdy fence. When you let your dogs out to the garden, don't be too surprised to see them run along the fences. This is considered a typical behavior for dogs and the primary reason behind this is to ensure no intruders have breached their territory. If your dog does this frequently, then you'll want to make sure there is a safe running path alongside the perimeter of the garden. Every once in a while, walk next to the fences and make sure the ground is firm and steady. If you come across any uneven ground, then try and level it as much as you can. Doing this may help reduce the chances of your dog getting injured. You should also pick out and throw away any dangerous objects like sharp rocks. Some people like to add a row of pea gravel or river rock to the inside perimeter of the fence, making it virtually inescapable. Once you are done checking the ground, start examining the fence. A tiny gap is all it takes for a small dog to escape underneath the fence. Ideally, the fence surrounding your garden should be a few feet deep. Some breeds of small dogs may jump high, so you'll also want to make sure the fence is high enough to avoid any possibility of your dog jumping over it. If you are just starting a garden, it is a good idea to research which plants are poisonous to dogs. Most dogs will not eat substances known to harm them, but puppies are another story. They explore with their mouths and may ingest something that could make them sick or worse. If you have an established garden and your dogs are taking a liking to dangerous plants, remove them in the Fall and replace in early Spring with better choices. Check out our list of toxic plants and then if you have additional questions, visit the ASPCA website. Sam is a gardening enthusiast who loves to learn and write about topics such as going green, conservation, pest control, and natural remedies. Learn more natural pest control tips at Organic Lesson.